Windows Movie Maker makes it easy to edit the video clips captured from your camera by trimming them to remove unwanted video at the beginning or end. Select a clip in the timeline. Click on Show Timeline if you do not see the timeline. Place the playhead where you want your clip to start. You can use the Next Frame or Previous Frame buttons in the Preview Monitor to fine tune the position of the playhead. 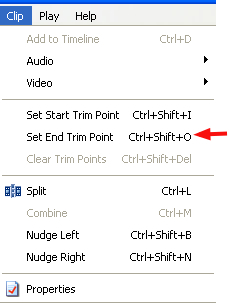 Select Clip > Set Start Trim Point. Place the playhead where you want the clip to end. Again, you can fine tune the position of the playhead using the Next Frame and Previous Frame buttons. Select Clip > Set End Trim Point. The video clip will be trimmed and any video outside the trim points will be removed. Select a still image in the timeline. Click on Show Timeline if you do not see the timeline. 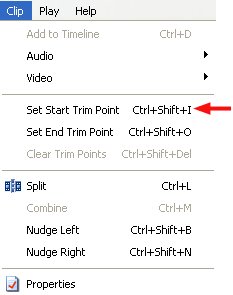 Position your cursor over either end of the still image clip until a double arrow appears. Drag the image clip’s end in or out to change the length of the clip. Select a clip from the Collection or in the timeline. Position the playhead where you want to split the clip. You can do this in either the Preview pane or in the timeline. 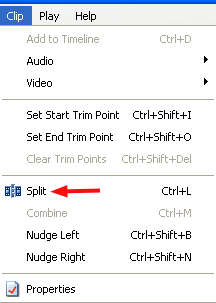 There are three ways to split a clip: choose Clip > Split, press Control + L on your keyboard, or click on the Split button in the Preview pane. You will then have two independent clips you can add effects to individually or move to different locations in the timeline. Place the playhead where you want to take a snapshot of the video. You can use the Previous Frame and Next Frame buttons to fine tune the position of the playhead until you get the image you want. Click on the Take Picture button in the Preview pane. 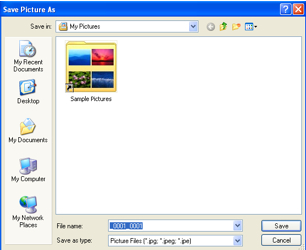 Enter a name for the image file and choose a save location, then click on Save.